We're a young, newlywed couple living and studying in Bath. We first met in an English lesson when we were twelve years old, and started dating when we were fifteen after discovering a shared love of Pink Floyd (and being blackmailed by one of our friends!). Our first few years together were spent in Cornwall, however when we turned eighteen we went to study at different universities - Grant in Cardiff, and Megan in Bath. After spending a few months apart we realised that we wanted to be living our lives together, and Grant proposed in Disneyland Paris on the morning of Megan's birthday. In 2012 we moved into our small flat in Bath together where we both now study, and on September 22nd 2013 we celebrated our marriage with all of our friends and family. We've never been more excited about the future, whatever it may throw our way. Whilst on our honeymoon, Grant suggested that it might be nice to start a blog as a couple, sharing our recipes, home and adventures. 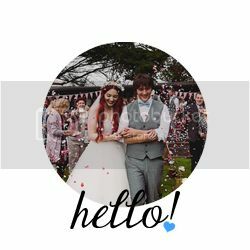 We wasted no time in throwing ideas around - since we both have so many personal projects ticking over on the sidelines, having a creative project we could work on together was a lovely idea, and so 'How Very Us' was born. Hello! My name's Megan, and I'm an aspiring young adult author currently working towards a degree in Creative Writing. The written word has always been my calling, but along the way I've picked up accompanying interests in photography, fashion and baking, sparking me to start my personal style and lifestyle blog, Briar Rose, in 2011. Blogging is one of the best things that's every happened to me (after meeting Grant, of course! ), so being able to share it with the person I love is a wonderful development. I'm very snap happy, I love whipping up new sweet treats in the kitchen, and I fully embrace my girlie, retro aesthetic in all aspects of my life. My favourite things include Disney, cats, and planning events. Enjoy! Hello there, my name is Grant. Over the years I've aspired to be many things - from a paleontologist to a recording artist - however, over the past four years (with a little inspiration and encouragement from Megan) my interests have shifted to focus on the media industry. After studying journalism from an academic perspective at Cardiff for a year, and realising that it wasn't for me, I turned my hand to Creative Media Practice at Bath Spa where I specialise in film production and post production. Meanwhile, I've decided to put out feelers into the world of blogging. I really enjoy cooking and making memories with my new wife, so I thought this would be a good way for us to share our adventures. Happy Reading!